31st edition of the Festival International Nuits d’Afrique – July 11 to 23, 2017 – For the Pleasure of Being Together and Enjoying an Unforgettable Experience! 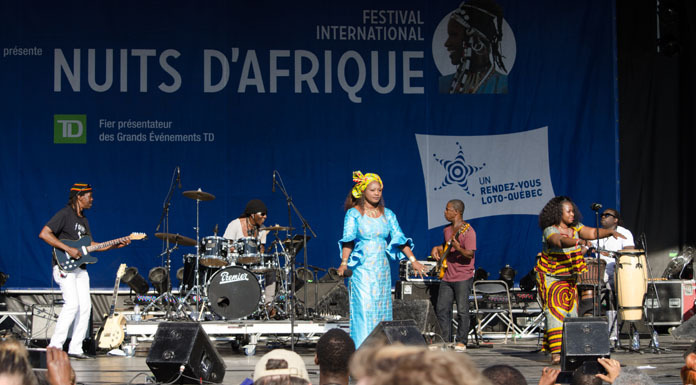 Montréal, May 31, 2017 – More than 700 artists from 34 countries and hundreds of thousands of festival-goers are converging on Montréal from July 11 to 23, 2017, for the pleasure of being together and enjoying an unforgettable experience at the Festival International Nuits d’Afrique, the greatest of world music gatherings! As a leading voice for cultural and musical diversity over the last three decades, the festival offers a broad range of concerts and events that join people from many backgrounds. With its finger on today’s pulse, this 31st edition reflects the increasingly intermixed and borderless currents in world music. From top names on the international scene to new generations of artists, they are coming to share with you their passion and joie de vivre. A total of 145 concerts and activities are being presented on indoor and outdoor stages during the festival’s 13 days. From July 11 to 23, eight concert series feature the most exciting of new presentations, the most powerful of voices and the most current of styles, not to mention the roots-oriented sounds that inspire them. From July 18 to 23, as if by magic, the Parterre of the Quartier des spectacles is transformed into the Nuits d’Afrique Village, a festive and colourful gathering place. Two spokespersons will spread word of the 31st edition of the Festival international Nuits d’Afrique. Brazilian artist Bïa and journalist and presenter Herby Moreau are forming a dynamic duo to convey the essence of the festival. This 31st season mirrors the stimulating agitation and effervescence shaking up world music. For example, there are Amadou and Mariam, the famous Malian couple performing at the official opening concert with their 1970s Afro-disco, followed on later dates by French soul master Ben l’Oncle Soul paying tribute to Frank Sinatra, the truly libertarian Tunisian electro artist Emel Mathlouthi and the much awaited Madagascan rockers The Dizzy Brains. Outdoors on the TD – ICI MUSIQUE STAGE, large-scale concerts include those given by Nigerian artist Seun Kuti, the worthy son of Fela, Congolese band Mbongwana Star, representing the wildest of what African is producing these days in terms of music, and Sidi Wacho, a happy blend of the most emancipated cultures. Watch a short clip from the spectacular free concert performed by the legendary Cuban ensemble Orquesta Aragón, presented last year during the celebrations of the 30th Anniversary of the Festival International Nuits d’Afrique.